I know it has been a little while since my last post. Life has happened and unfortunately some things had to be put on the back burner. However, at Henslee Farm Adventures, we are trying very hard to get back to where we need to be, especially since winter will be here before we know it. It seems strange to be talking about winter when we have had some absolutely beautiful days. In fact the temp is supposed to be up to 80ºF today! It is days like these that we like to take advantage of the nice weather and grill outside. Steve's favorite meal happens to be burgers and fries. 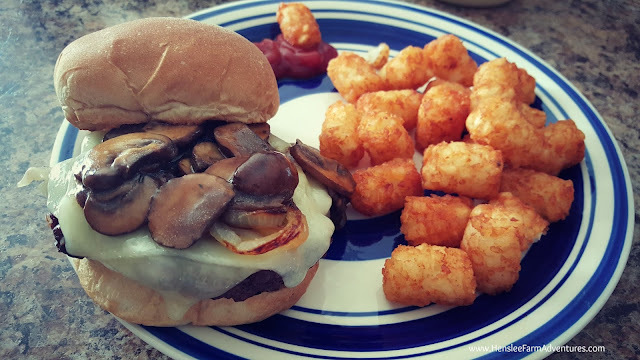 Well this day he decided he wanted a mushroom swiss burger. 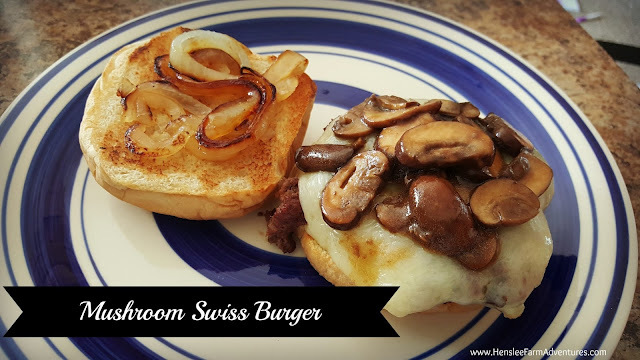 It sounded good to me, so I thought I would share with you how we make our mushroom swiss burgers. First, I am going to let you in on a little secret of how I make my hamburgers. I don't even tell Steve how I make them because he swears that plain is best. So I secretly season the meat before cooking and of course he loves it! We use ground beef that we have had butchered. Seriously folks, if you haven't tried grass-fed beef you need to. 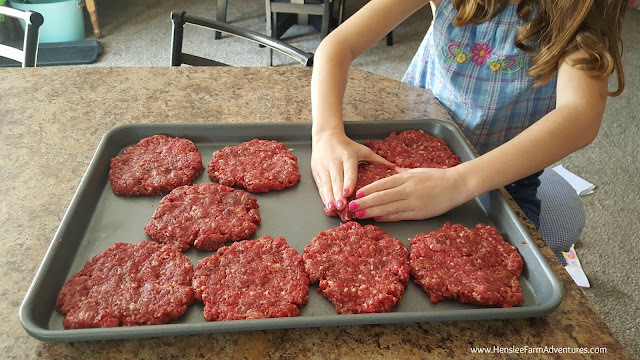 Of course you can use just regular hamburger from the store. And another kind that is really good is what my grocery store calls Boston Burger. It is 60% beef and 40% pork. This makes wonderful burgers and meatloafs! To make the patties, I put 2 lbs. 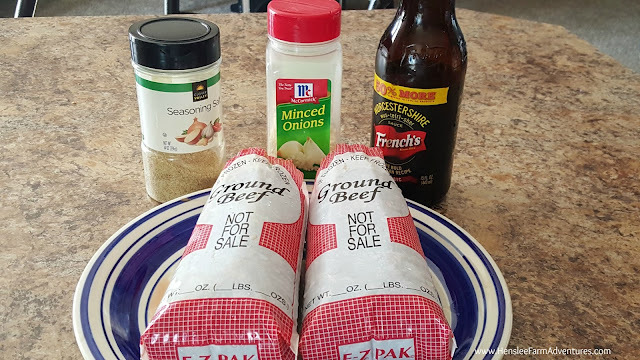 of hamburger in a bowl and add in 4 splashes of worcestershire, 2 tablespoons of mined onions, and 1 tablespoon of seasoning salt. I mix this with my hand until just incorporated. You don't want to over mix. Carly loves to help me cook! You can see we make some pretty big patties. There will be some shrinking, but if you make an indention in the middle, there will be minimal shrinking (I forgot to get a picture of the indention). Then you grill to your taste. We like ours medium well. 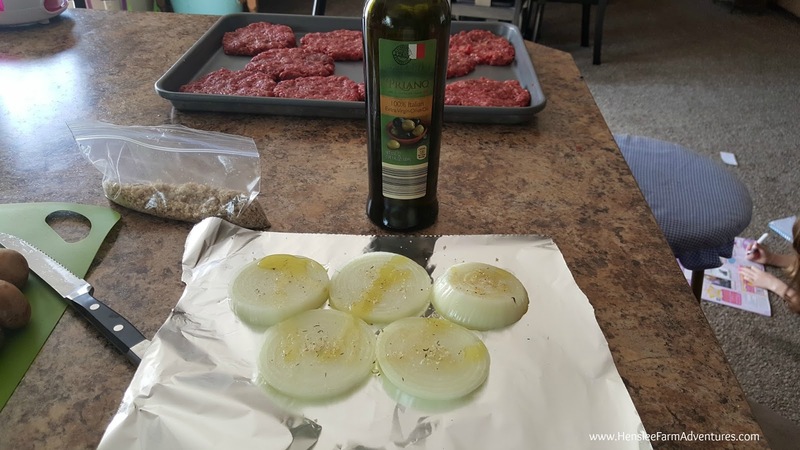 Usually while we are grilling, we take the opportunity to grill onions as well. We love grilled onions! I slice them pretty thick, put them on some foil and drizzle them with some extra-virgin olive oil. I also found some great seasoning at our local farmer's market. The lady that makes it smokes her salt with applewood. Man is it ever good! She calls it Stove-Side seasoning. You can use it on just about anything. Besides the salt there are other things she puts in there. It is definitely yummy! You can also use just plain kosher salt, or a seasoning blend of your choice. After I season the onions, I wrap them up in a foil packet and put it on the grill. We do flip the packet after they have cooked about 10-15 minutes on one side. Now for the mushrooms. 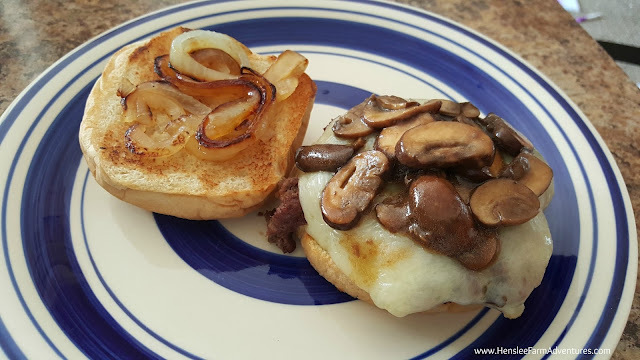 I have seen many recipes for the mushroom sauce for burgers, but I concocted one of my own with what I normally have on hand. My ingredients for mushroom sauce. I know what you are thinking, it doesn't look like it would be that good, but trust me on this. 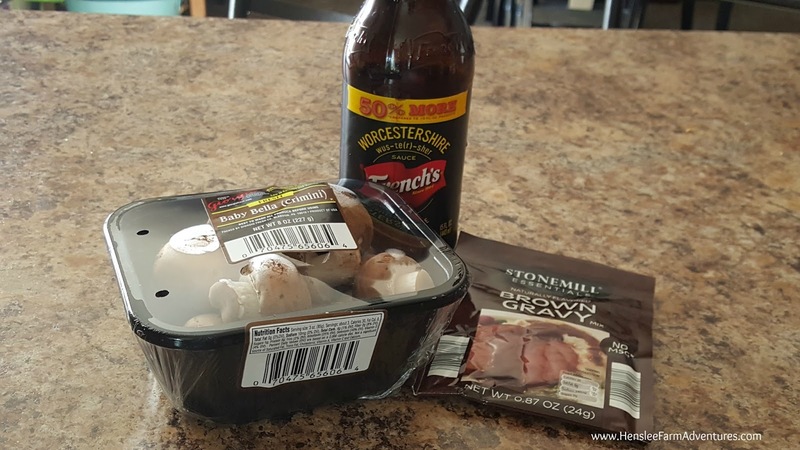 I lucked out and was able to get some mushrooms on sale at ALDI, one of my favorite places to shop! Also the brown gravy mix I get at ALDI as well and love it because it does NOT have MSG in it. I love this gravy mix for when I want a quick gravy, it is always so good and cooks up easy. 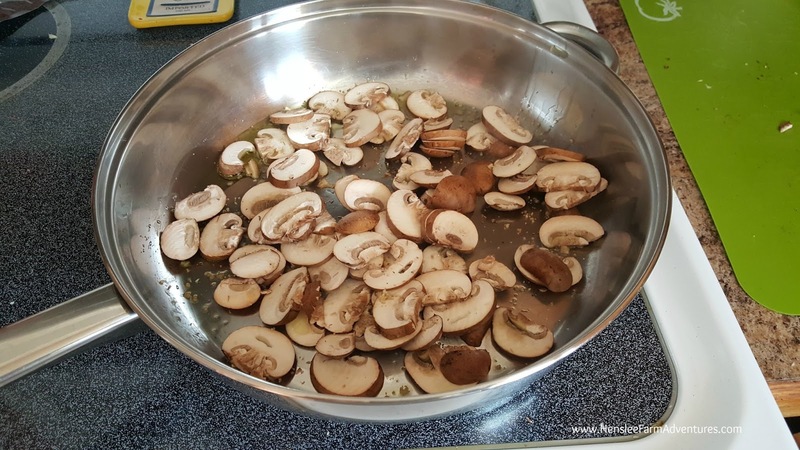 First I washed my mushrooms by wiping them off with a damp paper towel. You do not want to submerge them in water because they will absorb the water and you will end up with mushy mushrooms (ha ha!) in the end. After washing them, just slice them, not to thin because they will cook down. 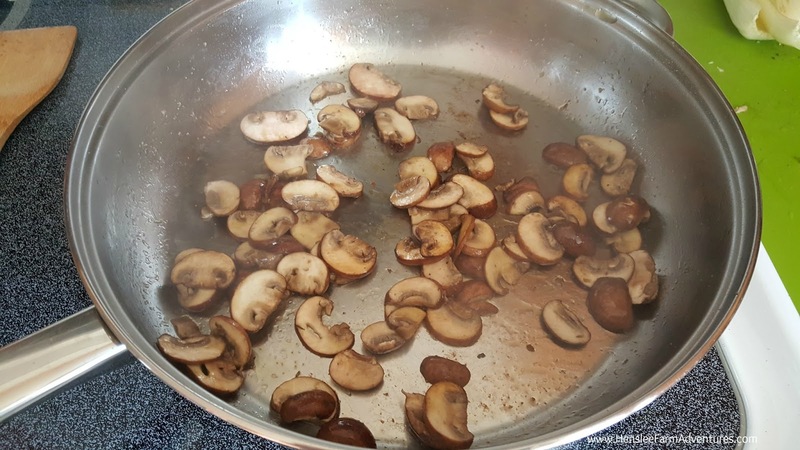 Fresh mushrooms in the pan. I add a little extra-virgin olive oil to my pan and put the sliced mushrooms in. Then I took advantage of that smoked salt and seasonings and added a little bit of that. I cooked this on medium heat. After they have cooked down to where they are soft (again I don't want mushy ones), then I am ready to season them. 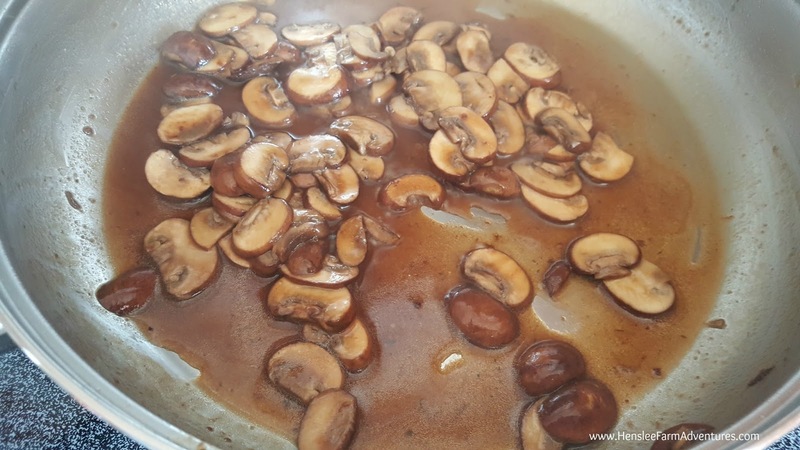 I add in two splashes of worcestershire sauce, then I take about a 1/2 teaspoon of the brown gravy mix and sprinkle it over the mushrooms. I cook it for just a minute more and then I have my mushroom sauce! So easy! All that's left is to build my burger. I of course got the swiss cheese at ALDI as well, I love their selection of cheeses! Steve put the slice of cheese on the burger while it was still on the grill so that it would be nice and melty. Here is my burger. I of course had to add some grilled onions to it as well. And let me tell you, it was so good! Steve's burger, looks pretty good! We decided to go with a side of tator tots instead of fries this time. The burgers were awesome! The mushroom sauce was perfect. I hope you try it and let me know what you think in the comments below.